J The Travel Authority: The Best Urban Rails-to-Trails in the U.S.
As transit networks for human-powered activities, rails to trails are bringing together communities, linked by a shared interest in a safe way to commute and commune with nature, and, in the process, protecting natural resources while also revitalizing local businesses. Nicknamed the Roarin' Elgin, the now retired Chicago, Aurora & Elgin Railroad once carried commuters and freight between Chicago and its suburbs. Its legacy, the 62-mile Illinois Prairie Path (IPP), one of the country's oldest rails to trails, is perfect not only for the botanically inclined but also the committed commuter. Urban grittiness is evident along the six-mile Ventura River trail where rotating and decommissioned oil derricks are in plain sight. But art installations also dot this trail, such as a bronze of oranges, reflecting the produce the railroad once transported, and other Ventura themes. Traced by a sandy beach, Golden Gardens as well as other parts of the trail offer views of the mighty Olympic Mountains, even snow-capped Mount Rainier, in the distance. The path -- it's dotted with aluminum sculptures as a nod to its railroad history -- allows bladers, walkers and cyclists to safely and scenically traverse the Gulf coast, tidal waterways, myriad leafy parks and quaint neighborhoods in a state that's hardly noted for its pedestrian-friendly clime. Short but oh-so-sweet, the 10-mile-long Minuteman Bikeway wanders through the landscape touched by the Revolutionary War, paralleling the Battle Road, aka Massachusetts Avenue, the route taken by British soldiers that marched to Concord. Following the path of the Lexington & West Cambridge Railroad from Cambridge to Bedford, this rail-to-trail is heralded as a year-round commuter way, even in the dead of winter. Many cyclists, joggers and bladers escape D.C. or commute on this trail that compliments the capital's retinue of memorials and monuments with lessons in history that are blended with a sense of peace rarely found in the chaotic Beltway. For 22 years since 1947, passengers could board a luxury train that cruised over towering trestles and through tunnels bored into mountains as it made the trip from New York to Birmingham, Alabama. That storied corridor has been transformed into the 62-mile Silver Comet Trail that spans Smyrna, Georgia (on the outskirts of Atlanta) to the Georgia/Alabama border near Cedartown in a rural North Georgia corner that's a mix of hardwood forests and rolling fields. Find out more about this these seven urban rails to trails in the article I wrote for NationalGeographic Traveler - Intelligent Travel. I was on the Minuteman Bikeway last week, or rather I crossed over it. In a car. I noticed that nothing indicates the bikeway. Is there a special sign that should go up when a bikeway crosses a city street? Right now there's a pedestrian crossing, but that doesn't seem like enough to me. These are so great to know about - thanks so much for sharing. What a scenic way to get around, minus all the traffic and noise. We have several of these in my area (Buffalo, NY). One used to be what was called the Peanut Line. I remember waving to the engineer out my grandmother's window when I was a child. 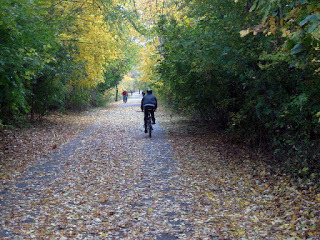 Now it is a beautiful bike path we use several times a week. There is a local movement to link all of the bike paths in the area into one large system. This is such a great idea. We have these in northwest Michigan, as well. My dad worked for the railroad, but I haven't traveled by train since I was a baby. This is something I want to do. Thanks for this post. Ahh ... none of them near me, really. Great list, though. Thanks, Roxanne. Glad you liked the list I chose. Hi fivecoat, I love traveling by train and also connecting with things associated with train travel. Hi Jane, I'll have to do more traveling in Michigan, especially checking out their rails to trails. Hi Brette, I didn't know about that movement to link all the trails. That's a very cool idea. 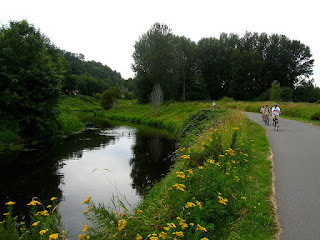 Hi Sheryl, I'm really big on rails to trails, whether I travel domestically or internationally. It's also great for the communities where the trails meanders; it usually results in an upswing in the economy. Hi Alexandra, Every community and rail to trail set it up differently in terms of designating the type of signage for when the trail intersects the street.